About 800 million people – one in 11 – are chronically hungry and malnourished on the planet today. By 2050, the world’s population is expected to grow to an estimated 9 billion people, which will further aggravate the situation. Meeting this increasing demand for food will be particularly challenging, because supply is constrained by factors such as climate change effects, depleted agricultural soils and the distribution of land, water and energy. Small-scale subsistence farmers who feed their families and sell a small surplus at local markets still provide food to the majority of people on the globe. Recently, the urban population exceeded the rural one for the first time ever. This means that cities are becoming increasingly dependent on the remaining farmers for their food. The surplus that subsistence farmers currently produce will not be enough to feed growing urban populations. Smallholder farmers need to make the transition to commercial agriculture to feed the world. For this, they need access to credit so they can buy tools, seeds and fertilizer. Lending will remain restricted, however, if banks fear that farmers are unable to pay back their loans in the event of a lost harvest due to flood, drought or other disasters. Here, insurance can play the same role in the developing world as it already does in developed countries: protecting farmers against the perils of nature to keep them in business, even if disaster strikes. "Partnering for food security" has been one of our Top Topics for many years. 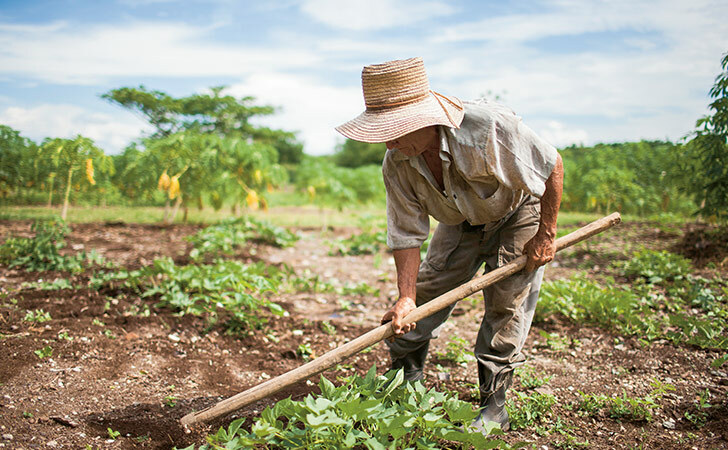 As part of our recent dialogue activities, we devoted an issue of our agro insurance hotspot series to Bolivia, where one in three of the working population is employed in agriculture. Numerous stakeholders assembled at our agricultural conferences in Merida, Mexico and Kunming, China to discuss how farmers’ open roof business can be made more resilient against natural perils.